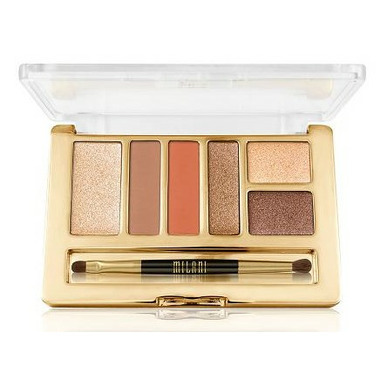 With Milani Everyday Eyes Powder Eyeshadow Collection you can contour, color and create endless looks with a first-of-its-kind eye contouring and highlighting collection. Each Everyday Eyes eyeshadow palette comes with six richly pigmented shades and a step-by-step guide for professional-looking results. Each shade is expertly coordinated to work well in any order to create brilliantly beautiful, one-of-a-kind styles. Dual-ended, pro-artistry brush included. Ingredients: Mica (CI 77019), Talc, Cetearyl Isononanoate, Dimethicone, Boron Nitride, Zinc Stearate, Sodium Dehydroacetate, Phenoxyethanol, Sorbic Acid, Tin Oxide, Ethylene/Acrylic Acid Copolymer, Poloxamer 338, Silica. +/- May Contain: Titanium Dioxide (CI 77891), Iron Oxides (CI 77491, CI 77492, CI 77499). shiny shade is not dense enough, but the color of this eyeshadow is so pretty. overall, i like it. These are really great eyeshadows. I took a huge chance and just ordered them online not knowing what I'd get but I have to say they are very, very good for the price! They are pretty pigmented and are true to come colour. Blending takes a little bit of work but it's still worth it! I definitely recommend this palette! Lovely eye shadows, well pigmented, look great together. Shimmer shades are a bit patchy, but otherwise a really good drugstore palette. Gorgeous drugstore palette! Shades are very pigmented and blend out beautifully. I am not usually one to wear coral shades but they compliment my blue eyes like no other shade out there. Highly recommend this for any eye color, but especially blue-eyed ladies. These last the entire day and I did not experience any creasing or fading, will mention that I wear an eye primer underneath. Great palette at a great price. Quality item from Milani.